The Minnesota Twins visit Kauffman Stadium on Saturday, July 1, 2017 to play the Kansas City Royals. The probable starters are Hector Santiago for the Twins and Jason Hammel for the Royals. The opening line for this matchup has Minnesota at -134 and Kansas City at +124. The Twins have a 32-40-5 over/under record and a 40-37-0 run line mark. The Royals are 39-38-0 against the run line and have a 35-38-4 over/under record. The Twins have a 40-37 overall record this season. Starting pitcher Hector Santiago has a 4-7 record with an earned run average of 5.37 and a WHIP of 1.43. He has 49 strikeouts over his 67 innings pitched and he's given up 66 hits. He allows 8.9 hits per 9 innings and he has a FIP of 6.11. The bullpen has an earned run average of 4.89 and they have given up 293 base hits on the year. Teams are hitting .268 against the bullpen and they've struck out 220 hitters and walked 105 batters. As a team, Minnesota allows 9.3 hits per nine innings while striking out 7 batters per nine innings. They are 24th in the league in team earned run average at 4.78. The Twins pitchers collectively have given up 712 base hits and 366 earned runs. They have allowed 114 home runs this season, ranking them 5th in the league. Minnesota as a pitching staff has walked 269 batters and struck out 539. They have walked 3.5 men per 9 innings while striking out 7 per 9. They have a team WHIP of 1.42 and their FIP as a unit is 5.04. As a team Minnesota is hitting .250, good for 20th in the league. The Twins hold a .413 team slugging percentage and an on-base percentage of .325, which is good for 15th in baseball. They rank 19th in MLB with 8.6 hits per game. Miguel Sano is hitting .270 with an on-base percentage of .370. He has 69 hits this season in 256 at bats with 53 runs batted in. He has a slugging percentage of .539 and an OPS+ of 138. Joe Mauer is hitting .290 this year and he has an on-base percentage of .358. He has totaled 73 hits and he has driven in 30 men in 252 at bats. His OPS+ is 103 while his slugging percentage is at .405. The Twins have 660 hits, including 134 doubles and 94 home runs. Minnesota has walked 284 times so far this season and they have struck out 647 times as a unit. They have left 548 men on base and have a team OPS of .738. They score 4.52 runs per contest and have scored a total of 348 runs this year. Kansas City has a 38-39 overall mark this year. With an earned run average of 4.75, Jason Hammel has a 4-6 record and a 1.44 WHIP. He has 65 strikeouts over the 83.1 innings he's pitched. He's also given up 93 hits. He allows 10 hits per nine innings and his FIP stands at 4.48. The bullpen has an earned run average of 4.40 and they have given up 258 base hits on the year. Teams are hitting .256 against the Royals bullpen. Their relievers have struck out 242 batters and walked 112 opposing hitters. As a team, Kansas City allows 9 hits per nine innings while striking out 7.8 batters per nine innings. They are 15th in the league in team earned run average at 4.26. The Royals pitchers as a team have surrendered 683 base knocks and 325 earned runs this season. They have given up 87 home runs this year, which ranks 27th in Major League Baseball. Kansas City as a staff has walked 252 hitters and struck out 592 batters. They give up a walk 3.3 times per 9 innings while they strike out 7.8 per 9. Their team WHIP is 1.36 while their FIP as a staff is 4.27. As a team, they are batting .246, good for 21st in the league. The Royals hold a .403 team slugging percentage and an on-base percentage of .300, which is good for 29th in baseball. They rank 22nd in MLB with 8.3 hits per contest. 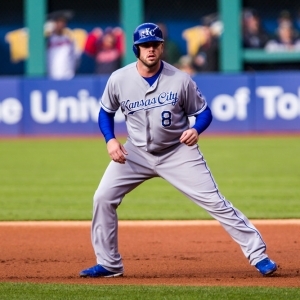 Mike Moustakas comes into this matchup batting .272 with an OBP of .310. He has 75 hits this year along with 47 RBI in 276 AB's. He maintains a slugging percentage of .540 with an OPS+ of 119. Lorenzo Cain is hitting .283 this season and he has an OBP of .354. He has collected 80 hits in 283 at bats while driving in 27 runs. He has an OPS+ of 112 and a slugging percentage of .452. The Royals as a unit have 641 base hits, including 121 doubles and 90 homers. Kansas City has walked 185 times this year and they have struck out on 581 occasions. They have had 476 men left on base and have an OPS of .702. They have scored 3.97 runs per game and totaled 306 runs this season.